An Aussie construction worker and part-time filmmaker (?) 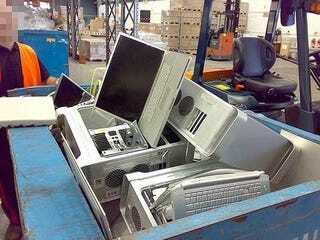 was instructed to destroy a substantial quantity of Apple equipment— some of which, he says, was salvageable. But can we really trust his account? The construction worker, who refused to give his real name, says that he destroyed nine full pallets of equipment, including MacBooks, Mac Pros, and even innocent Mighty Mice (Mighty Mouses?). He also claims that he tested some of the machines, and that many powered up, proving at the least that their batteries could be salvaged, if not screens and other parts.